Whoa guys. Long time no see. Don't mind the complete mess going on in these pictures. Really. 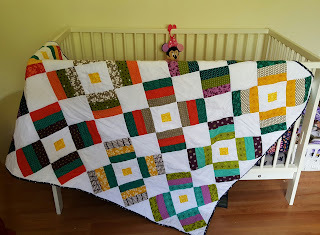 I was so excited to finish this baby quilt (giant baby quilt) for a dear friend of mine. They don't know the gender yet, so I was going neutral. I really love how it turned out. 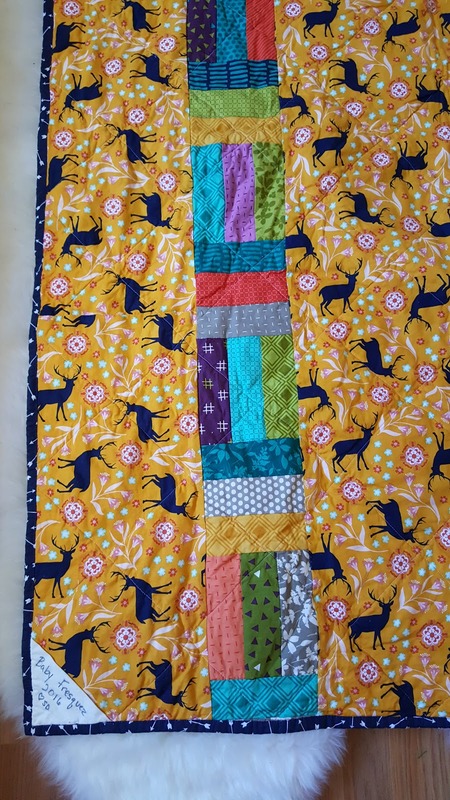 I used the Fireworks pattern out of the book Strip Savvy which has a lot of cute jelly roll quilts. For the fabrics I used a Basic Mixologie by Studio M for Moda jelly roll. The colors are really vibrant. The mother to be gave me yellow as a suggestion for colors... I guess this is my interpretation of yellow. 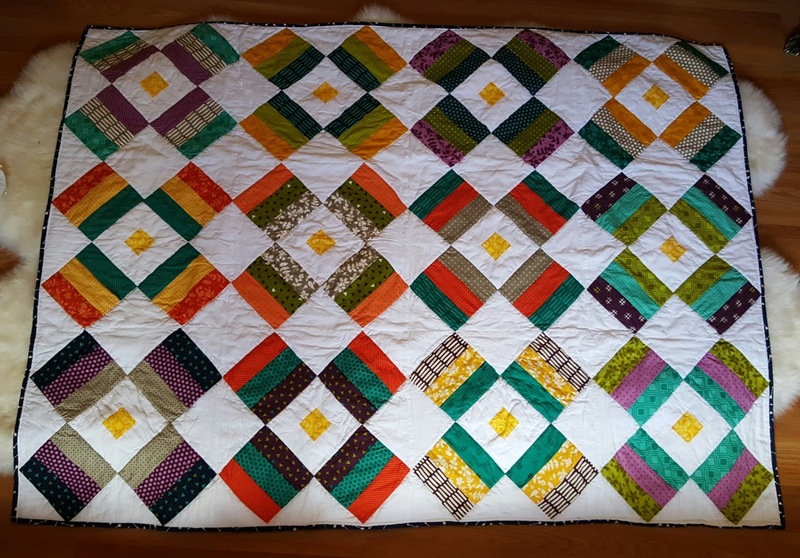 I enjoyed making this quilt especially, because my friend and I were running several years ago when she mentioned she had gone to a sewing boot camp class at Sew Crafty and loved it. 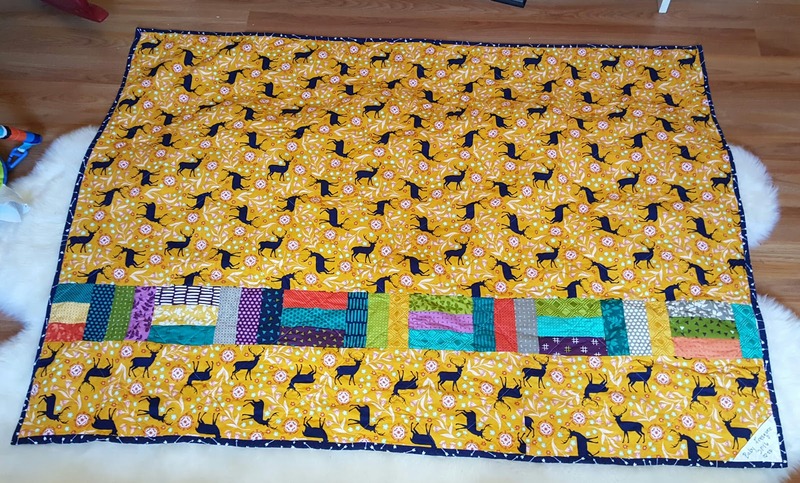 I had been Internet stalking the place for about a year, and she gave me the push I needed to try sewing. Since then it has become one of my favorite hobbies. In return for her encouragement to try sewing, I have since gotten to sew a project for their wedding, and now for their first baby. I love that. 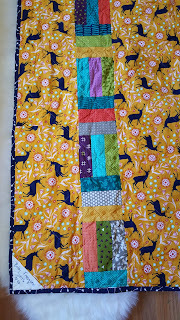 For the back I used some extra scraps and a great fabric we found at Joann's. When I saw the deer fabric it was the perfect color, but I thought it may be too feminine. Then Mr. Thinks He Can saw it and said it was for boys. That sealed the deal, and it became the perfect fabric for the back. 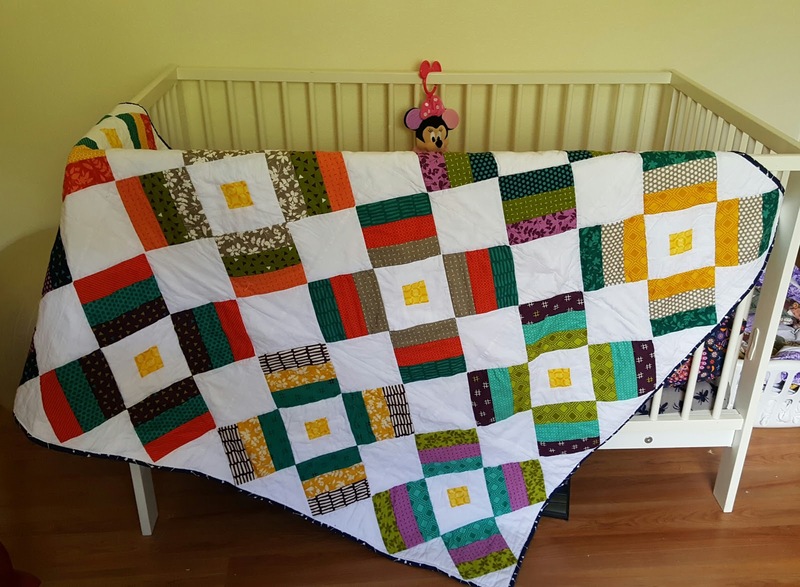 I digress here, but I found out my friend was waiting to see the quilt to decide on bedding for the rest of the nursery. I was so honored, and then freaked out under the pressure. I dreamed she came over, hated the quilt. I told her I could make a new one and she looked at me, said "That would probably be best." Then turned and left the room. I stayed in my room and cried the rest of the visit. Needless to say after I told her about my nightmare she told me that was 100% not going to happen in real life. When she opened the quilt she remained true to her word, and genuinely seemed to love it. I was sick with anticipation while she was opening other gifts though! This was my first time making a tag for a quilt. I just used permanent marker and a charm square folded in half and sewed it in with the binding. I like that it is in my handwriting, and it could be used to hang the quilt from a hook. For the binding I went with another fabric from Joann's. It is navy with white arrows. I went with a dark binding because I hope this quilt gets dragged around quite a bit. I also machine bound it because hopefully it gets dragged everywhere and will need to stand up to a lot of washes! Of course my assistant oversaw the whole thing. 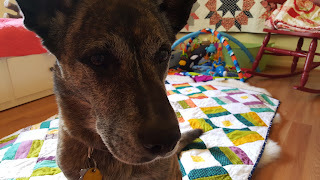 Yes, there are four quilts in this picture. I only made three of them! She is doing well, and has been great for helping me get out of the house as well as cuddles. Of course I had to include an updated Ashton shot. 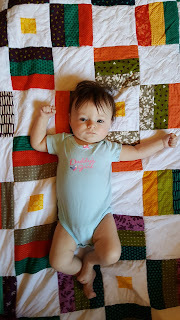 She watched me make a lot of this quilt, and seemed to like the colors as they were being put together. Hopefully she and the new baby will be good friends one day. You have an adorable pair of assistants there, Stacie. 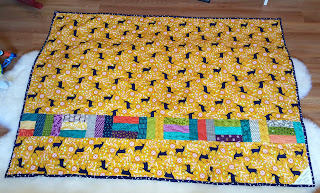 :) The blankie turned out fantastic - I love your colour choices and especially that deer fabric on the back. You're pretty darned good at this quilting thing! So nice to hear from you! 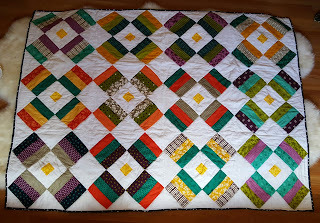 And what a lovely vibrant quilt! I have dreams like that too - so vivid and real. It's colorful and nicely designed.